NOTE: All of the music on this program is from three recent releases featuring the English master John Dowland (1563-1626). Alpha is particularly pleased to present this first disc devoted to the lutenist Thomas Dunford. The programme combines lute pieces by Dowland with lute songs for several voices. These songs are certainly among the most frequently recorded works of the Elizabethan era. However, the four-part polyphonic texture is generally reduced to a single voice with lute accompaniment. The approach adopted on this disc has been to realise the songs in several voices, thus reverting to the practice, widespread at the time, of an intimate ‘chamber’ performance of these pieces. Thus the inspired playing of Thomas Dunford is answered by exceptionally rich polyphony, with the combination of the two offering a Dowland of unprecedented colour and energy. Born in 1988, Thomas Dunford discovered the lute at the age of nine and obtained a first prize at the Conservatoire National de Région of Paris in 2006. In 2006, he continued to study at the Schola Cantorum in Basel with Hopkinson Smith. He has performed in many prestigious festivals such as Ambronay, Saintes, Nantes, Sablé, La Chaise Dieu, Arc La Bataille and Utrecht but also in England, Ireland, Switzerland, Romania, Poland and Japan. He has also recorded with Jeni Melia, Christopher Goodwin, La Capella Mediterranea, l’Ensemble Clématis, and Monica Hugget. He regularly shares the stage with Ensemble A 2 Violes Esgales Pygmalion, La Cappella Mediterranea, Pierre Robert, Scherzi Musicali, the Irish Baroque Orchestra, the English Concert, the Scottish Chamber Orchestra, and Les Musiciens de Saint-Julien. II. 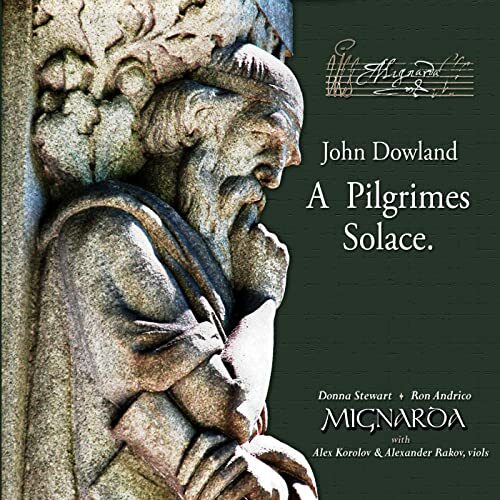 John Dowland: A Pilgrimes Solace (Mignard). Mignarda CD mp009. Dowland's last book of songs includes some of the finest, most sensitively wrought music for lute and voice in any language, and certainly represents the pinnacle of the English lute song. 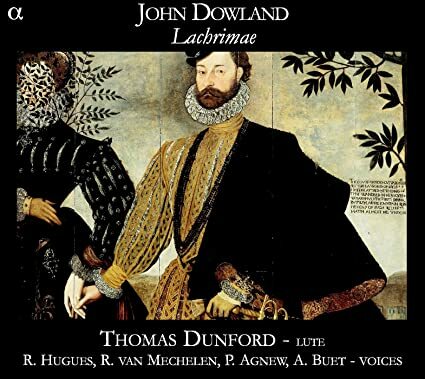 Dowland, who identified himself as “Jo: Dolandi de Lachrimae”, advanced a musical persona that was strongly linked with Elizabethan melancholy, and the familiar ‘Lachrimae' falling tear motif is found hidden somewhere in the texture of nearly every song on this recording. The notable feature of intricate writing for obbligato treble viol on three songs makes A Pilgrimes Solace a groundbreaking publication, despite the contemporary claim that Dowland's music was outdated. When we first began our concentration on performing music for voice and lute, some of the very first pieces we performed were part-songs from A Pilgrimes Solace. Published in 1612, music from this book is a capstone of Dowland's output; a mature artistic summation of one of the greatest composers of English song. Now entering our tenth year as a duo, we return to this music with a mature appreciation for the texts Dowland selected and a deeper understanding of his compositional skill. A Pilgrimes Solace also includes the earliest published example of English song scored for voice, lute and independent obbligato instrumental parts, and we are are delighted to be joined on this project by two sensitive instrumentalists, guest artists Alex Korolov and Alexander Rakov on treble & bass viols. III. John Dowland and his Contemporaries: Come again (Jan Kobow, tenor/Ulrich Wedemeier, lute/Hamburger Ratsmusik/Simone Eckert, dir.) CPO CD 777 799-2. From Amazon.com: John Dowland's music usually shows up in recordings in one of two ways; either as a release of all-Dowland compositions, or as part of a compilation of English renaissance masters. But unlike many of his colleagues, Dowland traveled extensively (if not always voluntarily) throughout Europe. In doing so, he was exposed to the courtly music of France, Italy, Denmark, and Sweden -- all of which influenced his own writing. Come Again programs Dowland's music alongside contemporary works by Samuel Scheidt, Orlando Gibbons, Michael Praetorius and others. The results are illuminating. In one grouping, for example, we hear Dowland's 1597 song "Can She Excuse My Wrongs," followed by Johann Schop's 1642 "Sollt' ich, oBild der Tugend nicht preisen," an anonymous Gagliard, and Gabriel Voigtländler's 1642 "Weibernehmen ist kein Pferdekauf" -- all sharing the same distinctive opening motif. Not only are variety of composers presented, but the texture is varied as well. Some selections are sung with ensemble, others with lute accompaniment, and the exclusively instrumental tracks don't all have the same line up of instruments. All of this combines to create an engaging and fresh-sounding listening experience. Simone Eckert and the Hamburger Ratsmusik perform on instruments of the period, and they do impeccably. 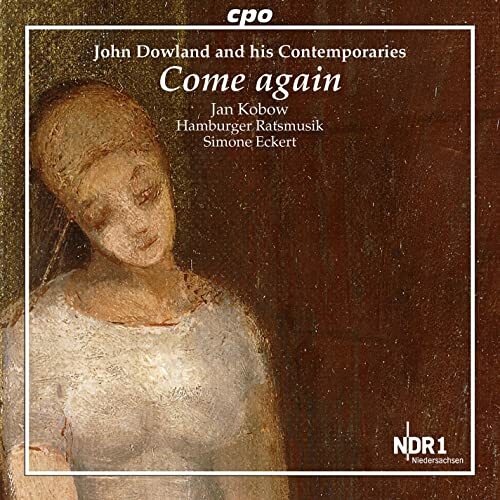 Jan Kobow's clear tenor voice has a slightly soft and warm tone that's perfectly suited to Dowland's delicate compositions. that was seen as associated with English aesthetics at the time. More than half the music is not by Dowland at all. The net effect of all this is to deflect attention away from the melancholy effect and toward Dowland's contrapuntal genius, an aspect of his music that has been insufficiently explored. Add in these factors: 1) Kobow offers no indication that he is anything other than a native English speaker, and he does a creditable job on such Dowland hits as Come Again; 2) the playing of the viol group is a good deal more expressive than you would be led to believe by the heavily footnoted booklet notes; and 3) the sound environment of the North German Radio studios in Hannover is little short of ideal. The result: a superior release that belongs in any collection of Dowland recordings or of music of the early 16th century in general.